I’m going to be honest, I wasn’t, and still am not sure if #thesubregister should continue, now that Bring a Loupe is back and Worn and Wound has also feature their eBay specific finds from time to time. So, I’m interested to hear and comments or feedback on if I seem to be finding some potentially different options from some potentially different suspects. Here is goes for October 2018. Photo courtesy of FS listing on ChronoTrader, click through for more details. I will admit that in the past 3-5 years, the words “Heuer Carrera” and “undervalued” were not a good association. But, I do think the term “under appreciated” could be applied to the very first “S” Carrera variants that had an eggshell white dial before the later silver starburst or soleil dial. Although the black or panda variant dials command the most attention, these matte off-white dials seem to bring a warm complement to the matte black “noir” dials, and almost seem to execute or at least convey the simplicity Jack Heuer was so passionate about, better. This one checks out as being original and correct, and would be a fantastic candidate for a sympathetic vintage relume. The minute hand is already showing lume loss, and the proper “vintage relume” would preserve this watch for the future and really bring it to life and make this a truly fantastic watch. It’s also priced to allow you to do just that, at 4250EUR asking on ChronoTrader here. Photo from FS listing, click through for more info on this iconic watch. Speaking of relumed hands, I’m not sure how one relumes with actual radium these days, but supposedly this one has completed that dangerous task, and the results are stunning. Admittedly, I feel a bit hypocritical posting such an obvious and out of reach for most grail after my opening paragraph, but this watch is just so fantastic to look at, and you just don’t see these for sale in this condition, relumed hands or not. The case is fantastic, and the everything else about this watch is about as good as it gets. This watch is asking vintage Daytona prices, yet is far more rare, and to be honest, more dynamic and interesting too. The case chamfers, the big eye registers, dauphine hands, and fat radium plots, this is sheer vintage tool watch at its finest. This grail has just seen its final price reduction to $75,000 USD on OmegaForums here. Box, paper, and an extra strap to boot. Photo from FS listing on WUS, click through for more details. Summer is coming to an end in most parts of the country that are not Phoenix, AZ, and here we have what just might be one of the best summer watches to fight the good fight against Seasonal Affective Disorder all winter long. It’s no secret the Nomos offers some of the most interesting, best bang for your buck watches in the game, and the Club has always represented a fantastic value with an in-house manually wound caliber that wears thin in a very a versatile case shape. I mention the case because it tends to wear larger than would be expected with its elongated lugs. And because of that, I actually think this watch looks far more proportionate in this larger 38.5mm size. Add the very cool “California” dial that mixes Roman and Arabic numerals and some subtle pops of color and you have a warm and interesting watch to remind you that winter won’t last forever, and at just $1050 asking on WatchUseek forums here. Photo from FS listing on ChronoTrader, click though for more info, and just look at that big flat polished bezel! So much to like on this one, so simple, but so clean and charming. Enicar made some wonderful tool watches back in its day, and this one is simple, clean, and just plain cool. An “explorer style” no date, matte white dial with applied logo and indices, signed crown, sharp case, dauphine style hands, and a 35mm case, for 250EUR asking on ChronoTrader here. I think it’s safe to say that at this price, your money is pretty safe, since this watch is so clean, attractive, and honest, with plenty of vintage charm. I promise this was not the motivation behind this post, but you have to smoke ‘em if you got ‘em right? 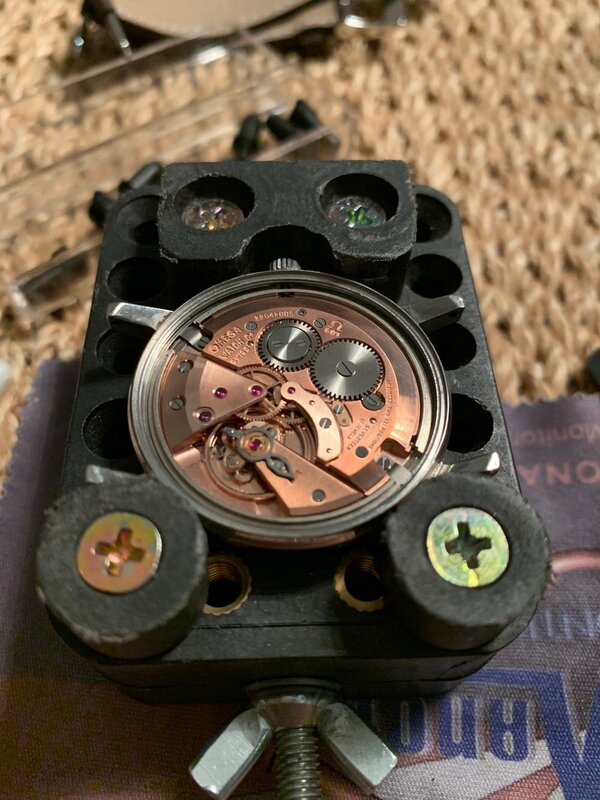 I don’t think it’s any secret (see directly above) that I seem to favor vintage 34-36 mm, white dial watches, especially if they’re no-date, manual wind, and/or thin, and this one checks every one of those boxes. I have been casually seeking an early manually wound Seamaster for a few years now, and this one happened to come up at right time, and on an original expanding Omega 1500R bracelet. I had every intention of keeping this one, as it is really more charming in person than photos do justice, but another watch that checks all of the same boxes recently found me, and one has to go. 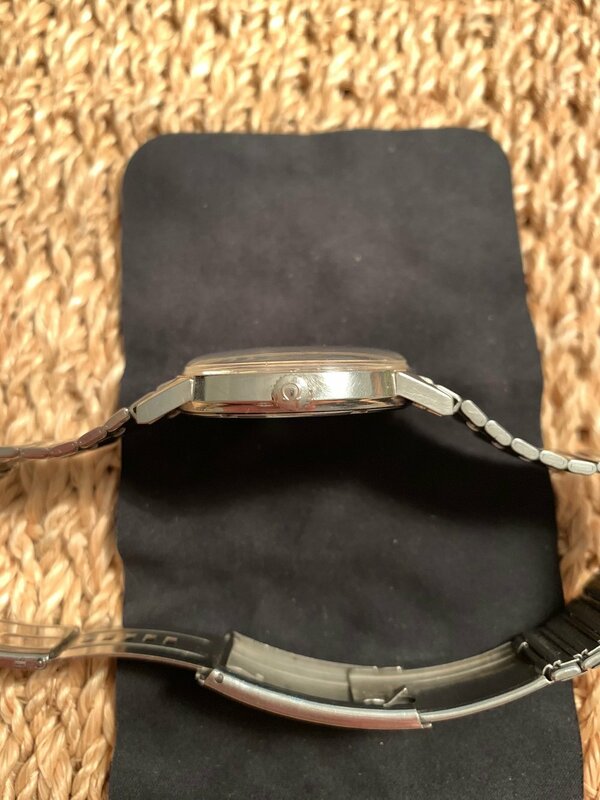 The 34.5 - 35 mm case appears unpolished to me, and is quite sharp overall with light surface scratches typical with wear (exactly as it should be), with original engraving visible on the caseback, that has some minor (read: not too deep but noticeable) scratches from a bad opening attempt. The signed crown winds and sets the manually wound movement that is keeping good time. I typically wear a watch for one or two days at a time, and it might be gaining a few seconds, but certainly has kept time within those periods. (I actually wore it 3 days in a row last week and it kept great time, FWIW.) The dial and hands are original and in fantastic condition, with no noticeable imperfections. 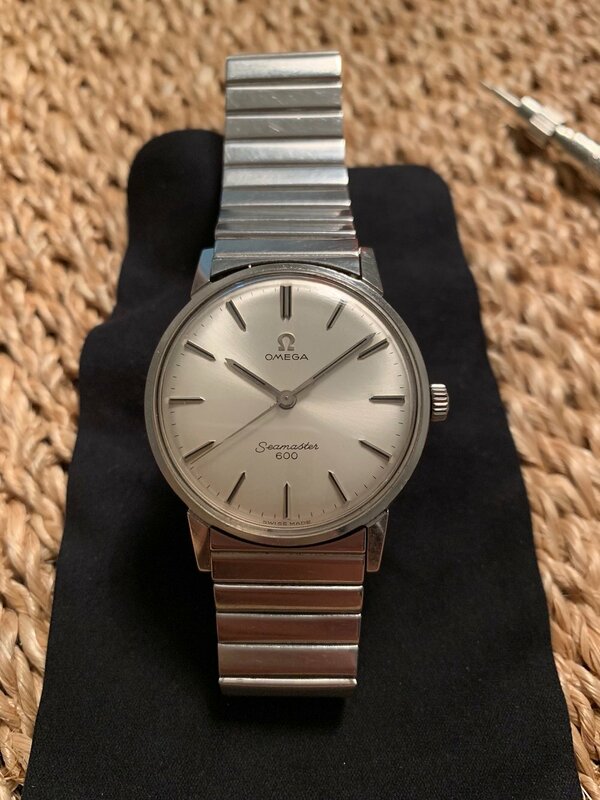 I believe the acrylic crystal, that is in great shape, is probably a replacement since I cannot find the Omega symbol in the center, at least with my naked eye. The expanding bracelet with quick clasp microadjust is very clever and tight overall, exhibiting little, if any stretch in the expandable links, with very prominent Omega symbol on the signed clasp, and # 10 end links in good condition. I believe this bracelet to be original to the watch, though it shows such little wear and stretch, both seem to be worn very little and lovingly. The bracelet has 12 of its stretch links and 16 folded links and is on the larger side overall at 8.1 cm on the 6 o’clock side and 8.3 cm on the 12 o’clock side, not including the end links, with the micro adjust open or 14.7 cm with the ratcheting micro adjust in the tightest position and 16.2 cm with it fully opened, not including the end links. 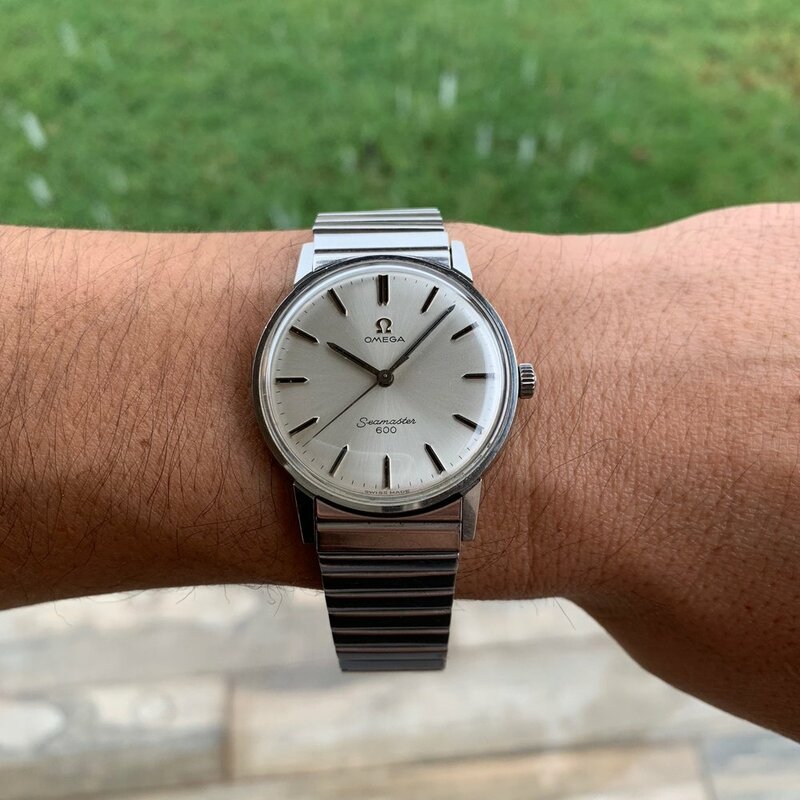 With this watch in such good condition and the omega bracelet included, I am pricing it at $725 USD net to me, with the buyer and I splitting the shipping method of their choice. Contact me here before it heads to the forums in the next week or so. 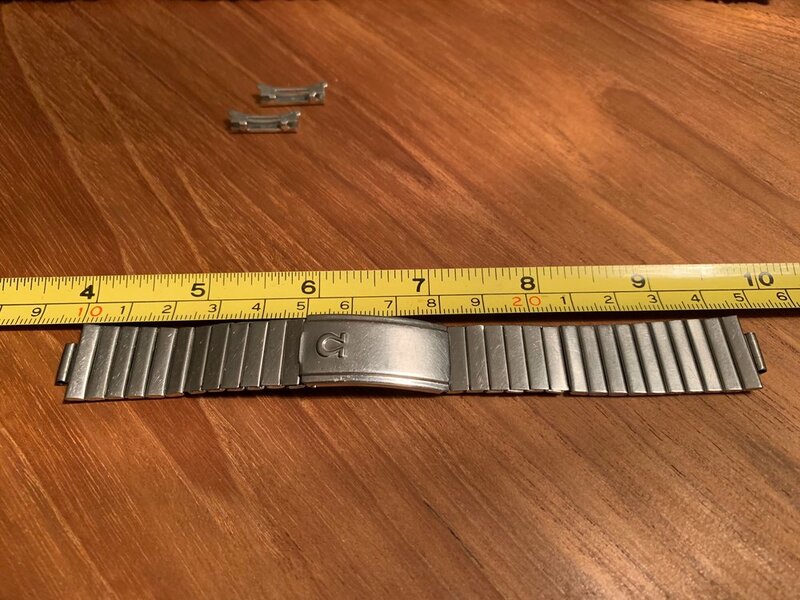 See below for pictures of the watch on various strap options from B&R Bands.